Long ago, anyone in the city of La Crosse could "attend" Common Council meetings by tuning them in on a radio. You could hear what new proposals were coming up, who was in favor and opposed, who had prepared for the meeting and who had not, and who understood Robert's Rules of Order and who did not. The broadcasts were provided by a local commercial radio station. In the 70s (I think), that service was taken over by UWL's campus station and then it was available on cable (not everyone had or has cable) and now it's less accessible than it was 50 years ago. I guess if you have cable/satellite and/or high speed internet you can hear the meetings, but if you don't you will have to attend or rely on La Crosse Tribune (sometimes restricted access) articles to know what's going on. Not all that long ago, when a big issue came before the city council, citizens were able to attend a committee of the whole meeting and give public input before the entire council. We did that when getting an anti-war resolution passed and when passing a minimum wage increase in the city. A few years back, those rights were severely restricted when the council decided to only allow public input at committee meetings. They kept the door to some public hearings at full council meetings partly open (ok if approved by vote of two-thirds of the council but not as a routine right.) And, while committee meetings are required to be posted online, often they are not posted until the very last minute with vague agenda items that makes it difficult to know what is being discussed when. In addition, while city council meetings are held in the evening, when more people are available to attend, some committee meetings are held in the afternoons or at other times when working people may find it hard to get to a meeting. Now, the city council is changing even those input rights. Under the heading "New Start Times for Meetings of the La Crosse Common Council," comes this little tidbit: "Starting with the July 2017 Judiciary & Administration Committee and Finance & Personnel Committee meetings, anyone wishing to register to speak on an agenda item, or register in favor of or opposition to said agenda item, must complete a committee registration form prior to the start of the meeting. No forms will be considered after the meeting has started, except in the case of public hearings that are required by law." I guess the good news is that those committees will now begin at 6 p.m. But if you are rushing to a meeting after work or picking your kids up from soccer or swimming or otherwise unable to be there before the meeting begins, your opinion, at least in the form of public input at the committee meeting, is out. 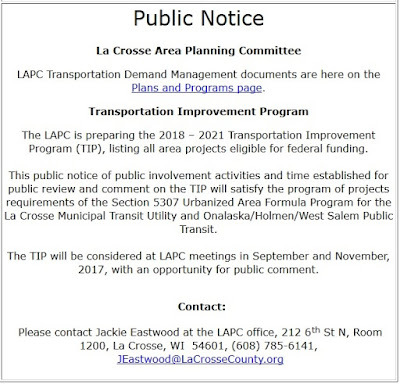 Consider, for example, a La Crosse Tribune article on Wednesday noting that planning is underway on La Crosse's 2018 budget. The Mayor may submit more than one budget, but one must be a "no tax rate increase" budget, according to the article. The article also mentions that, "The Board of Estimates will host public hearings on the budget no later than Sept. 10, according to the city website. The Common Council will take citizen input, and before the third Tuesday in November, approve the operating budget." Here's an opening for citizen input, but, I have been unable to find any details about the, "Board of Estimates will host public hearings," part of the article. In fact, the Board of Estimates' page is totally empty. So, it's nice to have people in city government telling us how open they are to more citizen input, but it would be nice to have that talk backed up by more not more restricted opportunities for public input and more opportunities for people to find out what's happening in city council and committee meetings. Budgets are important and citizen input in the budgeting process is vital. Apparently, this is coming. When we find out how input is possible, that info will be noted here.